I think by now we have all seen the pictures of our oceans devastated by plastic pollution and we all want to do better for our environment. How skincare is packaged has come up in conversation a few times and it’s an interesting discussion. Whilst I understand the objective of those interested in zero waste products I feel it’s important to remember that it might not be easy to abandon plastic overnight. Some products are packaged in a certain way because it helps preserve them; you can’t put every cream into a jar because it becomes prone to bacteria or may require a shorter shelf life. Consumer safety is important and ingredients for preservation are often the ones that most of us are trying to avoid. Glass is breakable so maybe viewed by some as a hazard in the bathroom. I know brands that have agonised over packaging decisions. It can often come down to marketing, aesthetics and shipping. There are some brands who package in cardboard tubes but then get complaints from consumers and stockists that labels rub off or the container becomes grubby with finger prints or tatty on the corners. This is people’s livelihood so if packaging lets them down over these types of misdemeanours I don’t blame them for returning to plastic. I use solid and liquid soaps but I will grumble at having to clean up the soap and dish, I perceive it as an eye sore even though I know it’s zero waste. We have to be honest with ourselves and a large part of the problem can be down to consumer attitudes, wonky vegetables anyone? Not all plastics are created equally, some natural brands have a least made an effort using 100% recycled bottles or they are made from recyclable PET, PP and PE with outer packaging created from sustainable, biodegradable sources and vegetable inks. I know for some people this isn’t enough but I’d rather a small step than none at all. If you are set on going plastic free then you definitely have to set your sights on smaller independent brands and you’ll have to be prepared to pay more. At this time I don’t think larger manufacturers are going plastic free any time soon so consumers have to protest with their wallets. Invest with brands meeting your standards and contact others to ask them to change their ways. You’re already one step ahead of most because by choosing natural and organic brands they are almost guaranteed to be supporting the environment in some way. Let us have a look at brands which are mainly using glass bottles and jars. Some of them may also use cardboard but there could be small plastic elements to some bottles, I’m thinking along the lines of lids and the plastic tubes on pump dispensers. 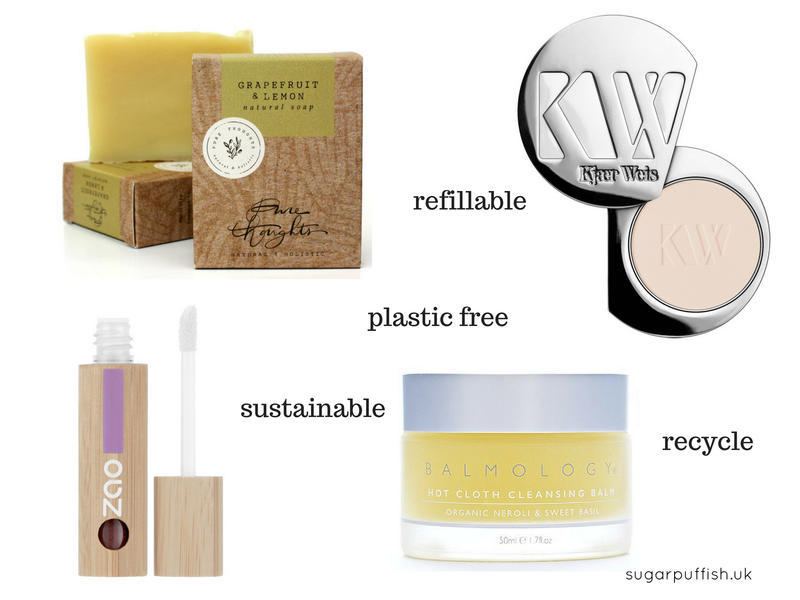 Pure Thoughts – glass for their skincare and candles, solid soaps with cardboard boxes. I am sure there are many more brands out there so you’re welcome to expand the list in the comment section below.